In the changes yesterday that Google made to their webmaster guidelines, Google changed the phrasing of “clear HTML” to “valid HTML.” So as expected, that phrase got a lot of attention, especially from those who advocate for compliant W3C validation, which Google links to. 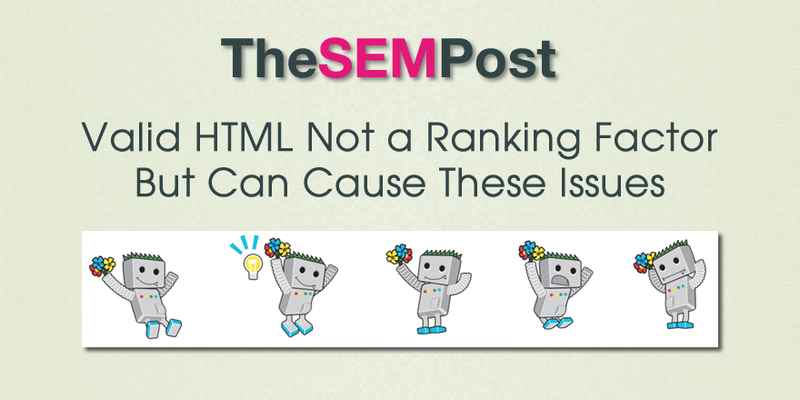 But is valid HTML a ranking factor? In today’s webmaster hangout, John Mueller from Google confirms that while using valid HTML is good, it is not a ranking factor. That said, it could lead to other issues that do affect SEO. So it’s not directly a ranking factor. It’s not the sense that if your site is not using HTML we will remove it from the index, because I think then we would have pretty empty search results. But there are a few aspects there that do come into play. So, on the one hand, if a site is really broken HTML, and its something that we see very rarely, then it’s really hard for us to crawl and index the content because we can’t pick it up properly. The other two aspects which are kind of newer is with regards to structured data. Sometimes it is really hard to pick up the structured data properly if the HTML is broken completely, so you can easily use a validator for structured data to actually understand that really well. The other thing is with regards to mobile devices and in general cross browser support. If you have broken HTML then that’s something that’s harder to render on newer devices. So those are kind of two aspects that kind of come into play there, which is why we kept that point. I think it used to say use correct HTML and we decided well correct doesn’t actually say anything properly, so we might as well just call it valid HTML and I think we even pointed at the validator. And it’s not that its a requirement that you must use valid HTML and we’ll remove you from search if you don’t, but it really makes it a lot easier for you to diagnose issues and for us to extract things like structured data for example and to recognize that it is actually mobile friendly. This will probably be a bit disappointing to those who offer valid HTML as a service. But if Google started to give a ranking boost solely based on valid HTML, it would definitely be more of a hardship to small site owners who lack the HTML experience to make code valid. The structured data part makes sense, and I do notice webmasters are more inclined to fix broken structured data than broken HTML, especially when they are wanting special features like reviews or a search box to show next their their site in the search results.